NOTES: “Hare knew that he could only be happy in a shelter that was exactly the same at this moment as it had been the moment before. 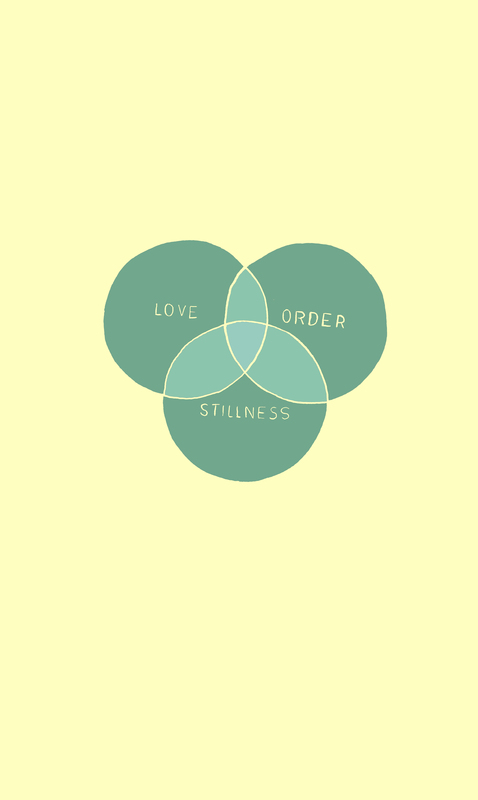 Out of this came his love of order and stillness.” – LRdL The cover illustration is derived from this quote. It is also a slogan that artist Jesus Landin Torrez lll has adopted and has used in his artwork extensively since the 2009 Marginalia show. More on Jesus later (Notes pg 6-14, 19, 20). The third chapter of Le Roman du Lievre focuses on Hare’s origins. We get to know a bit more about his character, exemplified in his cautious behavior. In Held Up I have taken this as an opportunity to look into the origins of our protagonist. We witness him prepare for his trip and are introduced to the environment, some of the ideas, and people that Le Roman du Lievre, Marginalia and this story came from. 2-4: In the final hours of working on this issue I made a few large changes. As I was writing the previous bit about room for ambiguity in comics, the point at which the narrative is just clear enough to keep the reader going, I realized I had crossed over to the other side. Too many ideas in too small a space. The story was nearly unreadable. So I changed some illustrations and cut out a bunch of the text. Leaving the pictures to tell the story. I mention this here, because one of the sections cut was largely responsible for the issues location, overall theme and mood. While planning this issue I was interested in the concept of psychogeography, how we change our environment, and more importantly how it changes us. I was also playing around with mapping, trying to draw a map of Anchorage (the town of my birth as well as the location for this issue) from memory. Pgs 3 and 4 were originally comprised of such maps and the introductory text alluded to some of these ideas. “Each generation reworks their landscape to speak to them of themselves. And in turn (consciously organized or not) these landscapes shape the emotions and behavior of the individuals living within them. Imagine yourself walking down a familiar street. By habit you choose the path of least resistance. Step off this path. Forge a new route. Why do you choose one direction over another? Have you become more aware of your surroundings? Do you notice as the atmosphere changes from block to block?” In the end having an introduction like this back to back with a discussion of consciousness and the soul was a bit too much. I will post some of the original drawings and links to information on the subject at the blog, as I do think it is a worth while topic. Also, maybe I will be able to work some of it into the collected version of Book One when it is completed early next year. Or I might rework the first 4 page, taking the emphasis off of the map, flight path, and bird’s eye view. 4,5: Part of this story takes place at the Anchorage Museum. Outside the museum there is a statue by Anthony Gormley titled Habitat. Its boxy form is said to apply an urban grid to the human body/form, which seemed relevant to the idea that the physical structure of a city could affect the mental structure of its inhabitants. (Though, as a city anchorage is lacking in such a grid, largely defined by the natural environment and its reliance on the automobile). 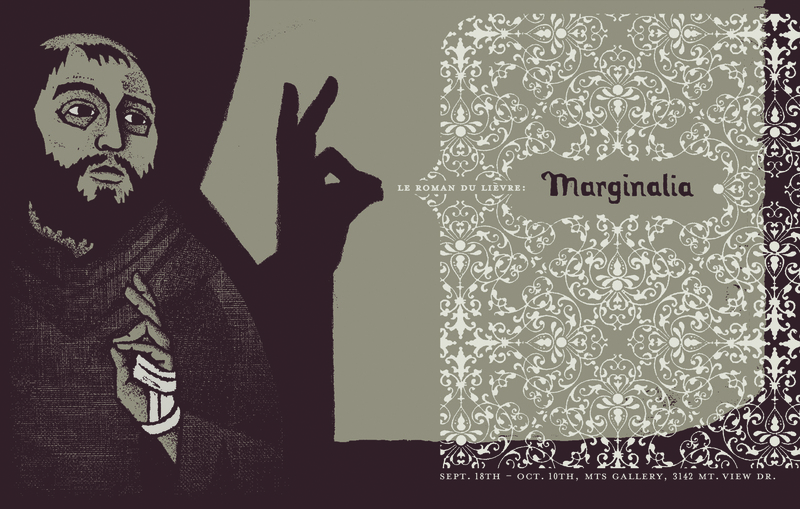 6,7: For the 2009 Marginalia exhibit Craig Updegrove designed a poster depicting Saint Francis making a shadow puppet of a rabbit. 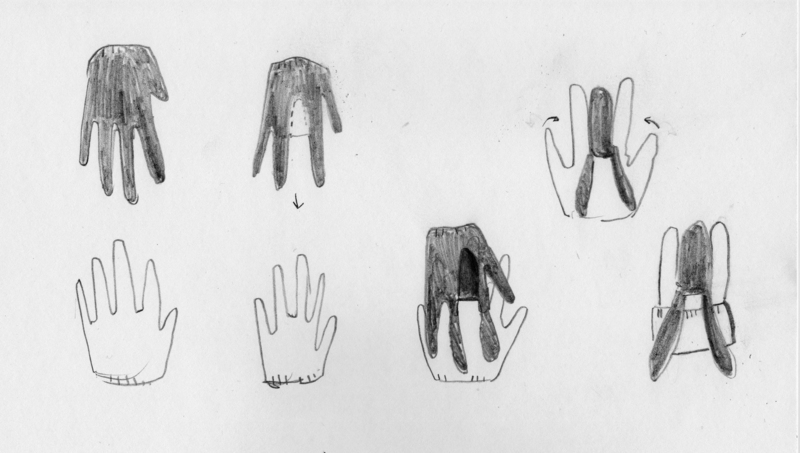 This is referenced at the beginning of the glove transformation sequence. 6-10: As mentioned in issue 2, copies of Held Up 1 were included on the merch stand at the Anchorage Museum as part of their recent Arctic Flight exhibit. Artifacts from Roger’s and Posts crash were included in the show. I thought it would be interesting to set the early part of this issue at that exhibit, making a visual note of this coincidence, possibly explaining why Post and Rogers were on our hero’s mind. Jesus participated in the marginalia exhibit. He drew the 3 words Love, Order and Stillness from the text of LRdL (specifically chapter 3) and created a pamphlet and mantra from them. He has continued to work with this text in a variety of ways over the years. Again, I will try and post links to more about all of this on the blog. 12: MTS Gallery is where the Marginalia exhibit took place. It is also the setting of the piñata “flash back” from last issue. 12,13: MTS was located in the neighborhood of Mountain View, which is where the beginning of this drive takes place. It is also one of the oldest neighborhoods in Anchorage. In 1989 Mountain View was names USA Neighborhood of the year. Just recently a study came out stating that it is the most diverse neighborhood in the country. Neither of these things matter to the story, but I thought they were worth mentioning. 16, 17: This 2-page dream sequence is a loose retelling of the Brer Rabbit Tar Baby story in a Peanuts inspired newspaper comic style. It will probably be changed before I print the virst book as a whole. I chose to change the name of the Tar Baby to Gum Doll (a character in African legend that the Tar Baby was based on) so as to avoid the story being read in terms or race. Check out the Gum Doll story and the Native American Tar Wolf story to see where the Tar Baby story was derived. Some how a bottle of Brer Rabbit Molasses (Was the tar baby made of molasses?) ended up as a piece of ephemera in the Marginalia exhibit and catalog. Similarities between Uncle Remus and Saint Francis had also been discussed on the blog preceding the exhibit. These panels are intended to mirror the sock bunny narrative and give a bit more context to the clump spirit character and further the comic’s investigation into memory through metaphor. Also, while searching the internet I came across a few old Brer Rabbit Molasses ads, as a result I have started putting a bit of molasses in my coffee in the mornings and have discovered the delicacy that is molasses and milk. I recommend both. 18-20: The sequence with the dog carrying the rabbit is based on the introduction to a story written by Alaskan poet Bruce Farnsworth. 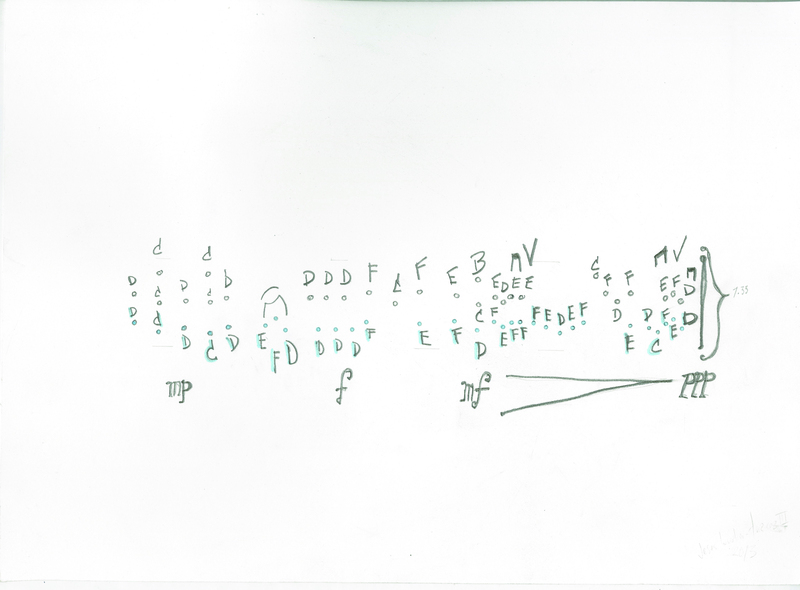 The original story was his contribution to the Marginalia exhibit (writing it out in its entirety in the margins of his copy of LrDL) and included in Appendix G. The introduction was also included in the catalog and performed at the Marginalia opening reception in the fall of 2009. 18-21: While researching this issue I read Introducing Consciousness. The text from these pages is a rewording of a part of that book: “Sometimes consciousness is explained as the difference between being awake and being asleep. But this is not quite right. Dreams are conscious too. Dreams are a sequence of conscious experience, even if these experiences are normally less coherent than waking experiences. Indeed, dream experiences, especially in nightmares or fantasies, can consciously be very intense, despite their lack of coherence—or sometimes because of this lack. Consciousness is what we lose when we fall into a dreamless sleep or undergo a total anesthetic.” – David Papineau 21: Ted Stevens International Airport.